I am interested in understanding the evolutionary mechanisms that are behind the emergence of novel genes in genomes. I am also studying the role of repetitive sequences in the expansion of coding sequences and the formation of novel protein domains. Mar Albà graduated in Biological Scienes at the University of Barcelona (UB), and obtained the PhD in the same University in 1997. During 1997-1999 she studied for the MSc in Bioinformatics and Molecular Modeling at Birkbeck College while working as a postdoctoral researcher in the group of John Hancock at the MRC Clinical Research Centre, in London. Later she joined the group led by Paul Kellam at University College London to develop new computational tools to study herpesvirus evolution and function. 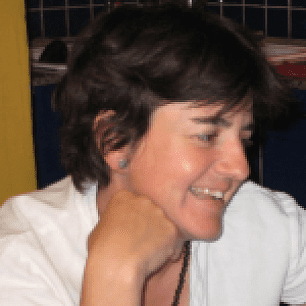 She was awarded a Ramón y Cajal tenure track position in 2002 to work at Universitat Pompeu Fabra (UPF). In 2005 she was appointed ICREA Research Professor at IMIM Foundation. She has directed 8 doctoral thesis and is author of more than 60 publications. C. Pegueroles, S. Laurie, and M. M. Albà, "Accelerated evolution after gene duplication: a time-dependent process affecting just one copy." Molecular biology and evolution, 2013. S. Laurie, M. Toll-Riera, N. Radó-Trilla, and M. M. Albà, "Sequence shortening in the rodent ancestor. ", Genome research, 2012. M. Toll-Riera, S. Laurie, and M. M. Albà, "Lineage-specific variation in intensity of natural selection in mammals. ", Molecular biology and evolution, 2011. L. Mularoni, A. Ledda, M. Toll-Riera, and M. M. Albà, "Natural selection drives the accumulation of amino acid tandem repeats in human proteins. ", Genome research, 2010. M. Toll-Riera, N. Bosch, N. Bellora, R. Castelo, L. Armengol, X. Estivill, and M. M. Albà, "Origin of primate orphan genes: a comparative genomics approach. ", Molecular biology and evolution, 2009. D. Farré, N. Bellora, L. Mularoni, X. Messeguer, and M. M. Albà, "Housekeeping genes tend to show reduced upstream sequence conservation. ", Genome biology, 2007. M. M. Albà and J. Castresana, "Inverse relationship between evolutionary rate and age of mammalian genes. ", Molecular biology and evolution, 2005. R. A. Gibbs et al. (including Albà M.M. ), "Genome sequence of the Brown Norway rat yields insights into mammalian evolution. ", Nature, 2004.